Next to Badoo, Tinder is the second most popular dating app, and already counted an estimated 50 million people using the app in late 2014. The numbers are likely to be similar, but growth has not stopped for Tinder in North America, and more than 1 billion swipes are made every day. What are swipes? Well, if you’re not familiar with the dating app, let me quickly explain how it works. Tinder hit the dating market like a storm and quickly became the dominant dating app on the scene with a simple system that allows adult users to sign up and instantly browse through the profiles of local singles in their area. If a user is interested in the person they see on the picture, they can swipe right, or swipe left if they are not interested. Every user that receives a right swipe gets to decide if they want to swipe right back, or reject by swiping left. If both users swipe right, you have a match and they can start communicating. Simple, but effective in a way that has been very attractive for younger millennial audiences. How Can You Spy on Tinder? How and why to spy on a Tinder account has more than one answer, but there are a few things to watch out for. If you quickly search for how to spy on Tinder, you are likely to find websites promoting services that are not necessary, ineffective, and downright don’t work as advertised. This guide is aimed at helping you make a choice between the available services that do indeed work, and that I have tested myself with dummy accounts. If you are not familiar with cell phone spy apps, I suggest you get acquainted with compatibility requirements before trying to install the apps on your smartphone, as many features won’t work if done incorrectly. I also have a complete and lengthy guide on cell phone spy apps that can aid you in answering just about every question that may arise. There are some popular websites popping up on the web that offer to provide user location, and the date and time which they lasted used Tinder, at the cost of $5 or so per search. Swipebuster is the most popular website of the sort, but I advise against using it because it’s a total waste of money. Swipebuster uses Tinder’s public API database available for third party software developers that want to build apps around Tinder’s platform. The information they are able to provide can be had free of cost by simply creating a dummy Tinder account, and looking for the user in the database. Tinder themselves have answered privacy concerns advising the website only provides public information, and re-iterates that users can simply signup to find out if someone is on Tinder, instead of paying for a single search on their database. All in all, don’t waste your time or money, because this service cannot monitor on actually spy on any Tinder user. There are more than a couple dependable monitoring apps available, but not many currently offer Tinder spying capabilities. At the time of writing this guide, there are only two reputable service providers that have built-in Tinder monitoring features, being mSpy and Flexispy. I have tested both, and specifically created Tinder accounts for each, exchanging a varied amount of communications to ensure that they worked properly. 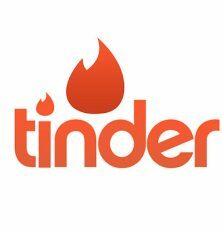 If any other services update their app to include Tinder, I will be testing them and adding my results below. For the moment, mSpy beats out FlexiSpy for tinder spying by having more capabilities, and an easier, cleaner dashboard, but overall, the two are similar and below I detail every feature, captured information, and comparable differences between the two. As advised, mSpy offers more features regarding Tinder monitoring than any other service on the market. The service is able to not only capture all conversations and matches, but also displays the profile information including, location, age range preference, and gender preference. 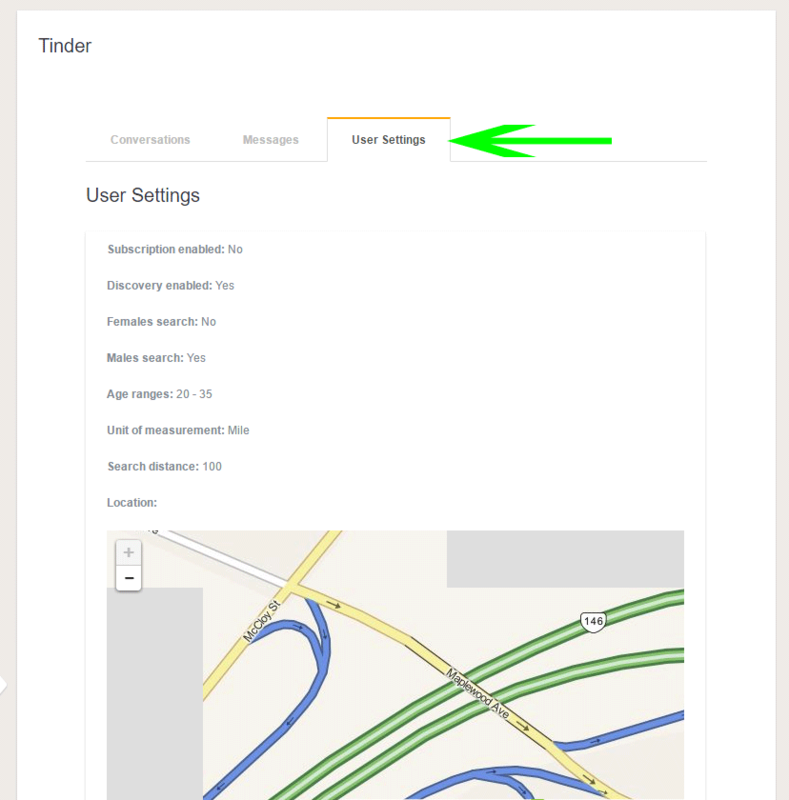 The dashboard is very easy to use, and of course it is capable of monitoring much more than just Tinder, but below I cover Tinder specific features. You can read my full review of mSpy for a complete overview. 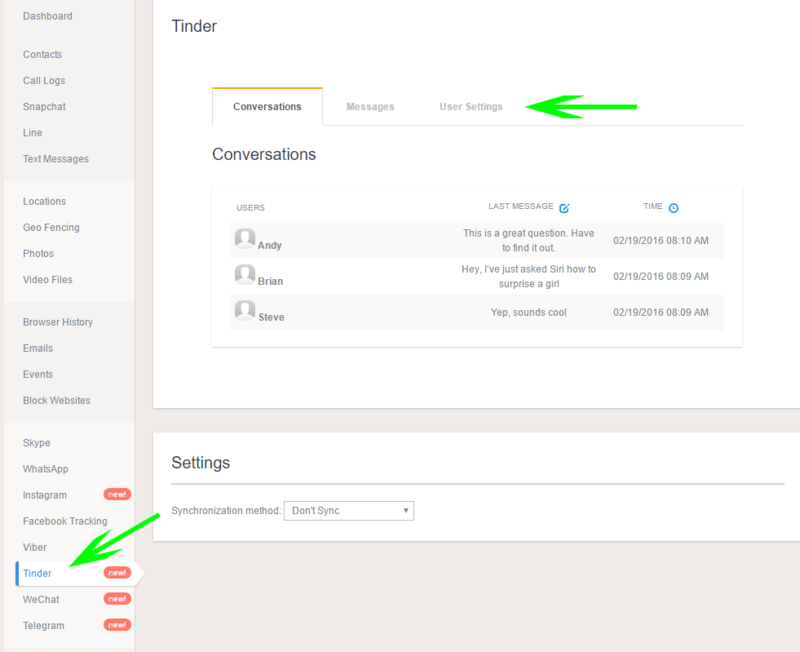 Once logged into mSpy’s dashboard, you will have a dedicated Tinder tab under the various apps you can monitor, and the section will include 3 tabs: Conversations, Messages, and User Settings. This section covers GPS location, gender preference, and age range preference. This information is most useful to parents, especially if they have an underage child using Tinder, which is restricted to 18+ members. The app will allow parents to keep their children save in case of bad judgement. This section will contain all the matches, and imitated chat conversations that have been collected, as well as the last message sent with a date and timestamp attached. You can click on any conversation to open the full chat window, which takes you to the Messages tab. 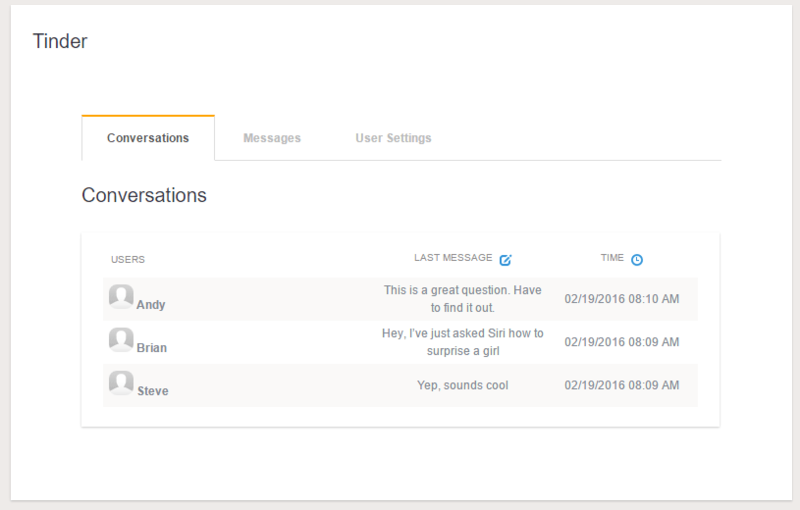 Under Messages, you get a full window of the full chat conversation exchange of text messages between matches. You also have a quick drop down menu which allows you to switch between any match, or partner they met on Tinder. Each message has a date and timestamp attached. The only other service to properly and effectively monitor Tinder profiles is FlexiSpy. They arguably have a more capable service due to providing the ability to remotely activate the smartphone’s camera and microphone (learn more on the full FlexiSpy review), as well as record voice calls. However, the service does cost more for all those features, and when it comes to Tinder, they have some advantages and some disadvantages compared to mSpy, starting with the fact that Tinder monitoring is only available for Android devices. Let’s have a look. 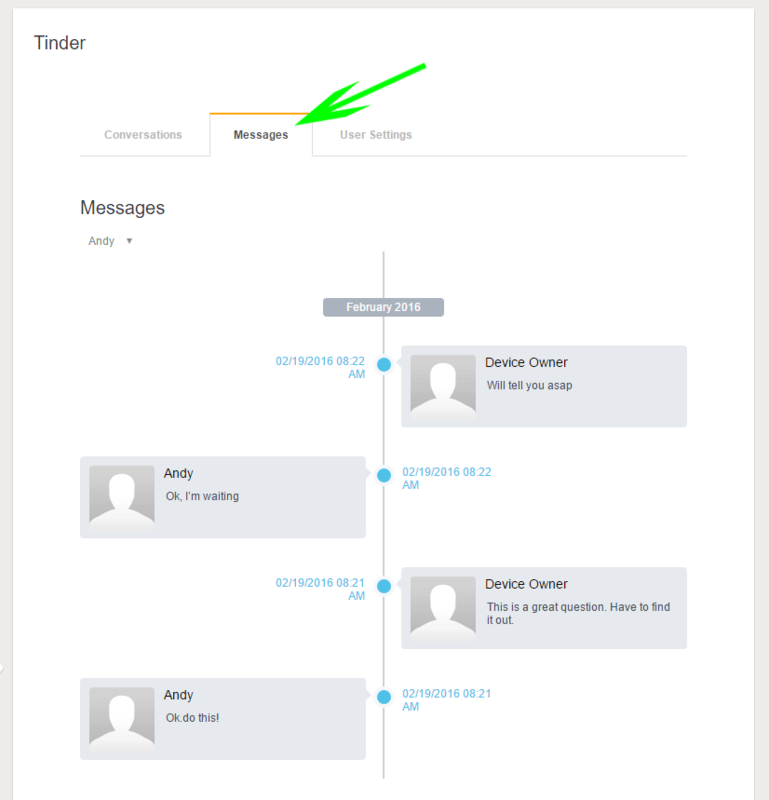 Once logged into FlexiSpy’s dashboard, the Tinder section will be found under the IM – Instant Messenger menu where you can access a variety of different messaging apps. Once you have selected the IMs menu, you can go under Instant Messages, or Messages section and select Tinder from a drop down menu. This will isolate all Tinder conversations for you. The interesting bit about FlexiSpy, is that they include profile pictures, as well as animated GIFs used in the chat, unlike mSpy. Otherwise the service works almost identically, albeit only being available for Android at the moment. Unfortunately, FlexiSpy does not currently provide any profile settings information regarding selected age range and gender preference. It also does not provide any additional location information, but the service does have built in GPS tracking for the cell phone itself. If you’re looking to spy, monitor or track a Tinder user account, it may be likely that you’re suspecting your romantic partner of cheating. I have previously published information regarding this type of activity, and why I advise against it, but my goal is not to lecture anyone, or try to tell them what to do, but instead inform them of the advantages, and disadvantages each scenario presents. In the end, the choice is yours. 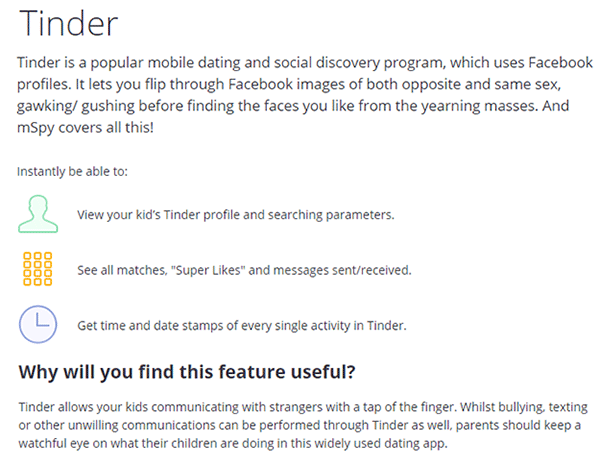 It is also likely that you’re a parent looking out for your children whom might be using Tinder illicitly and putting them in direct danger to predators since they are not of adult age. You should know that you are not alone, and there are thousands of scenarios where cell phone tracking apps have helped parents stop predators from getting close to their kids. Cell phone spy apps are used by millions of parents thanks to the enormous protection features it adds to the technology used by kids. Regardless of your motives, the solutions listed above work as advertised, and are able to log every message exchange done across the app. Although they cost monthly or yearly subscriptions, I highly advise to consider the cost as an investment, because there is no such thing as a safe and functional spy app that is free of cost. However, I must declare mSpy as the clear winner when it comes to Tinder spying. Not only is it available for phone Apple iPhone and Android users, but it provides the most information. On the other hand, if you need FlexiSpy’s advanced features unrelated to Tinder, and are on Android, the service does provide logging of all messages, and even includes pictures and animated GIFs used in the conversations.